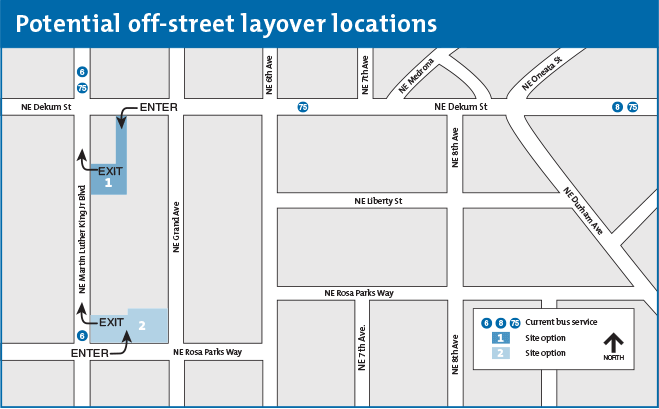 TriMet is soliciting public feedback as the agency considers creating a permanent off-street bus layover location for Line 8-Jackson Park/NE 15th Ave in northeast Portland. Line 8 buses currently layover on the street at two areas in the Woodlawn neighborhood, which are several blocks from the last stop on Northeast Dekum and Durham. TriMet has been meeting with the neighborhood for the past three weeks, and will hold a community meeting on Wednesday, Nov. 13. Creating a permanent location for operator layovers would improve on time performance and service reliability for riders, and provide a safe and convenient place for operators to take their breaks. Line 8 is a Frequent Service line and among the busiest bus lines in TriMet’s system, serving around 6,000 trips each weekday. TriMet studied many locations for a permanent facility before narrowing options to two sites that have the dimensions necessary to park and turn buses. In addition to lot size, the sites were chosen primarily because of their proximity to Northeast Dekum and Durham and their access through primarily business oriented area. Both sites exit onto Martin Luther King Jr. Blvd, one with an entrance from Dekum and the other from Rosa Parks Way. The final layover location will contain an operator break/restroom facility and possibly include landscaping, sound walls and lighting. It may also allow for a new bus stop to transfer between Frequent Service lines 8 and 6-Martin Luther King Jr Blvd. Both bus lines run every 15 minutes or better most hours of the day. We are currently conducting community outreach about the two proposed layover sites and how it can work for the community. Some people have expressed concern about negatively impacting small businesses, but we are working collaboratively with the neighborhood as we seek a location. Once this outreach phase is finished at the end of November, the feedback will be considered and another community meeting will be announced in early 2014. Changes to the Line 8 made in September 2012 led to buses laying over at Northeast Dekum and Durham. After concerns were raised by the neighborhood, TriMet moved the layover location, and has continued to work with residents, businesses and the Woodlawn Neighborhood Association to lessen the impact of the changes. In March and June, we were able to move bus layovers to alternate temporary locations, while working on a permanent solution. For more information, visit trimet.org/line8.